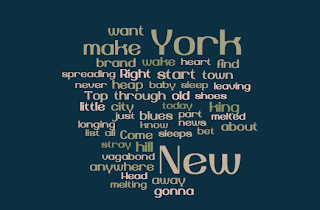 A word cloud is a visual representation of word frequency. The words occurring most often in the original text appear largest in the graphic design. In digital technology, a word cloud (or tag cloud) provides links to further information. It is a popular visualization of words typically associated with Internet keywords and text data used most commonly to highlight popular or trending terms. Computer technology aside, word clouds are very powerful to help visual learners through a beautiful, informative image that communicates much in a single glance. 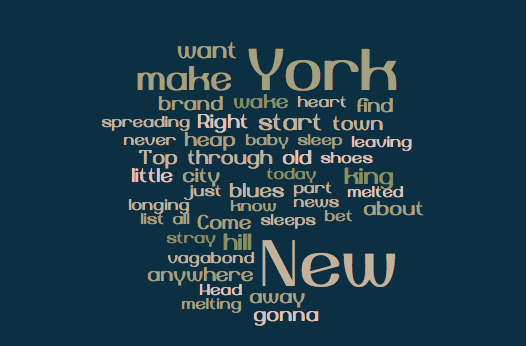 The image in this post is a word cloud I created using the lyrics of the song "New York, New York".